Last week, we shared some tips for evaluating new or existing vendors to ensure they can properly support your event. If you missed that post, check it out here. Now that you’ve vetted your suppliers and secured the ones who will make your event a success, it’s time to work on nurturing those relationships. The goal is to develop a partnership built on mutual trust and respect, as that is how you will get the most out of your suppliers. We conducted a survey of event suppliers to find out what makes them tick. What do they need in order to provide the best level of service? How do they like to be treated? Why do they drop everything to come to the aid of certain customers and not others? The lesson? Have a budget in mind and be realistic about what you can afford. You don’t work for free, and you shouldn’t expect your suppliers to, either. Additionally, 25% of those surveyed said that their biggest frustration is when a customer is vague or unclear when requesting a quote. Providing clear, specific details about your requirements and expectations not only ensures that you’ll get exactly what you need, but it will save your supplier the headache of preparing multiple quotes – which can start your relationship off on the wrong foot! Here’s a final tip from one of our respondents: “If a customer was able to pay 15-25% of their order at the beginning of the year when my cash flow is low, I would give them a much better deal.” The Canadian event season can be short, so offer to pay your deposit early – when your supplier’s services are less in demand – and you may be able to negotiate better pricing. Even if you can’t be flexible with your payment schedule, there may be other ways to secure great pricing. Ask your vendor about possible discounts and what is necessary to earn them. Some suppliers offer referral discounts or will consider sponsorship opportunities. Whether your vendor is delivering a product or a service, there are a few things you can do to help strengthen the relationship at this stage. Walk the site or go through the event schedule with your vendor ahead of time to ensure you’re on the same page. Trust us – the more information you can provide, the better. That way, your supplier can help anticipate possible issues and make expert recommendations in advance. Delivery will also be most efficient when they have a clear idea of what to expect on site. On the day of delivery, be available (or appoint someone else to be available) on site to answer any last-minute questions. Even the most organized, proactive team can encounter a couple of unexpected hurdles. It’s in your best interests to provide some direction in those situations instead of allowing your suppliers to guess how you’d like them to handle things. Finally, if you have a service-related problem on site, bring it to your vendor’s attention! Mistakes happen, but a good supplier will appreciate the opportunity to make it right. If you want a long-lasting partnership and the best possible level of service, you’ll need to be willing to give your supplier constructive criticism when things don’t go exactly right. Okay, we know that sometimes the “payment” phase comes before the “delivery” phase. No matter where this stage falls in your event planning process, it has the potential to turn a relationship sour if not handled properly. 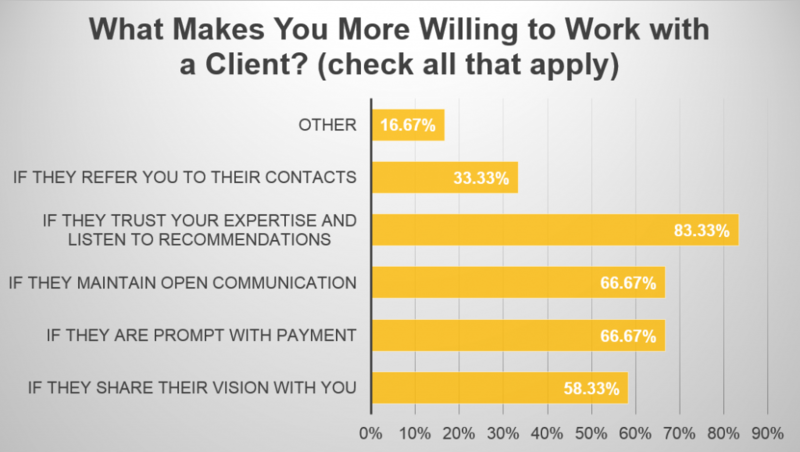 A whopping one-third of our survey respondents told us they have to chase clients for payment about half the time. That takes a lot of time and energy that could be dedicated to servicing other event customers! To earn the highest level of service, show your vendors you respect them by paying them on time. They will be sure to prioritize your needs the next time you require their services! One-third of our respondents said that only about 25% of their event customers follow up with them after the event. Another 30% of those surveyed only ever hear from 10% of their customers post-event! When it comes to events, the adage “no news is good news” does not always apply. Your suppliers want to know how they’re doing; in fact, 100% of our respondents indicated that they would like to hear from their event customers more often. If you’re happy with your vendor’s products or services, let them know! As we mentioned earlier, constructive criticism is important to ensure you receive the level of service you deserve…but customers often forget to thank their suppliers for a job well done. At Modu-Loc, we like to share customer feedback with our employees. There’s no bigger compliment than a customer acknowledging their hard work! You can also show your appreciation by referring other potential customers to your supplier. Help your vendors grow their business, and they will be sure to repay your kindness with exceptional service. Show your suppliers that you respect them by remaining transparent, honest, and loyal, and by ensuring that payment for their services is prompt and accurate. In return, they will provide you with the highest level of service at the best possible price!